A Certified Mental Health Technician (CMHT) also referred to as Mental Health Assistants or Psychiatric Aides, work as a member of team, under the supervision of psychologists, psychiatrists and counselors to care for emotionally disturbed and mentally ill patients. Certified Mental Health Technicians (CMHT) are typically employed by public and private psychiatric hospitals, nursing homes, and residential mental health institutions. Certified Mental Health Technicians (CMHT) coordinate mental health services, interview patients, document treatments, and help patients with their needs. According to the Bureau of Labor Statistics the number of Certified Mental Health Technician (CMHT) positions is expected to increase by approximately 6% by the year 2018. 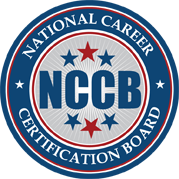 Mental Health Technicians who pass the National Career Certification Board’s (NCCB) Certified Mental Health Technician (CMHT) examination will have a competitive edge in the job market and Mental Health Technician profession. The median expected salary for a typical mental health technician in the United States is $31,832 according to www1.salary.com (October 2014). Mental health technicians/aides work in a wide variety of settings including mental hospitals, community general hospitals, community mental health centers, psychiatric clinics, schools for mentally handicapped, social service agencies, geriatric nursing homes, child or adolescent centers, and halfway houses.